As we race towards the end of the first half-term of The Boy's Reception year in school, I thought now would be a good time to write my review of the Stamptastic labelling system that I was sent during the Summer holidays. Yes I could have written the review before school started, but I actually wanted to focus on the durability of the near-permanent name stamper on a range of different materials. Stamptastic is a way of labelling children's clothes and other school belongings that takes seconds, doesn't require sewing or ironing on labels, or indecipherable writing with a Sharpie pen which has bled all over the label. Quite simply it involves a stamp with the child's name on it and an inkpad. I did The Boy's entire uniform (5 polo shirts, 5 sweatshirts, 3 jogging bottoms, 4 pairs of trousers, 3 pairs of shorts, coat, hat, P.E kit – shorts, daps, t-shirt, joggers, sweatshirt), book bag, lunchbox, lunchbag, and water bottle within five minutes. All of it, in five minutes. The process is incredibly simple: order a resin stamp block with your child's name embossed out of polymer, choosing three different fonts and a variety of sizes; and then order an ink pad. Within a week, the set will arrive ready to personalise your child's uniform. The actual stamping surface is 38mm x 15mm so it fitted really easily onto every clothes label that we had, it is also clear and doesn't bleed; it dries within a couple of second. The ink is an oil-based ink, which is the equivalent of a marker pen, but doesn't run. Apologies it's not the entire label but as I have never shared The Boy's name, I decided that would be a bit daft to do so now! However, this close-up shows the quality of the stamped image. Six weeks after stamping everything, and with the uniform having been washed every week, it is safe to say that on clothing the ink is excellent and has not faded at all! The only thing that it has come off from is The Boy's plastic water bottle and plastic lunch box. This is something that Stamptastic are aware happens, it's to do with the coating that the plastic items have which prevents the ink from being absorbed. However, it's not a problem as it takes less than thirty seconds to locate the stamp set and restamp it! The stamper costs £8.00 and the ink pad costs £10.00, and I think that is excellent value for money. It's an equivalent price to iron-on or sew-in labels, with the added benefit of lasting a lot longer, and being nowhere near as time consuming! 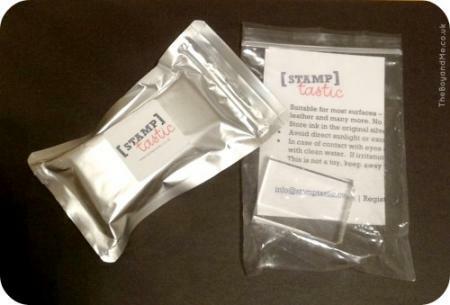 Stampastic gets a big thumbs up from us! Not something I need but the idea seems good. How many stamps do you think you get out of a pad? Glad you like it! I hate ironing too! yeah so we bought one after your recommendation and now the world has been labeled. Pick up anything in our house and somewhere you will find a little stamped name! This makes me happy! It's a bloody genius solution to a huge problem for parents of school age children. Enjoy stamping!